Now in our seventh season Long Crendon Film Club screens the very best in British, International and Classic cinema. Over 150 films screened to date - over 5000 tickets sold. Or to put it another way: We have filled the Royal Albert Hall. We consider ourselves a Community Cinema and as such our screenings are also a social event for the village to enjoy. 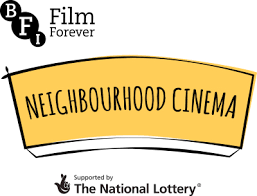 Our project is supported by BFI Neighbourhood Cinema. Many thanks to Long Crendon Parish Council and the Local Area Forum for awarding us a grant towards part of the purchase our equipment. Seating sixty-five the screenings take place in the cosy surroundings of Long Crendon Community Library in glorious HD quality on our big screen with 7:1 surround sound. It's a proper cinema experience. The season runs from September to April with weekly Friday evening screenings featuring a programme of over thirty films. Membership is open to anyone over the age of 18. You do not have to be a member of the library to join the club. Long Crendon Film Club is a project of Long Crendon Community Library. The community library is run as a charity with a team of volunteers and all profit made by Long Crendon Film Club goes towards helping to keep the library open.